NBA – Cleveland Cavaliers started the night with old school uniform from the 80’s wearing the orange and white NBA Jersey. The Cavaliers dominated the visiting short-handed Miami Heat 114 – 84 at the Quickens Loan’s Arena. Kevin Love had a double-double game, leads all scorer with 28 pts. and 15 rebounds, LeBron James scores 27 pts. with 8 rebounds and 8 assist while Kyrie Irving scores 23 points 1 rebound and 3 assist. The Cavs big three (Love, James and Irving) made history as the second trio in franchise history to scores at least 20 points or more in three consecutive games since 1972. 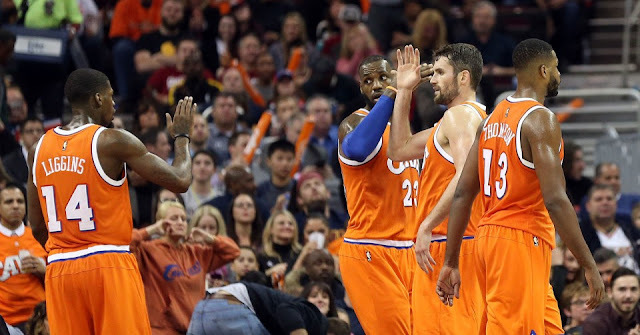 The win also improve the Cavs standing to 16 wins and 5 loss holding the best record in the Eastern Conference. Tomorrow the team will be facing the visiting Charlotte Hornets to try to complete a 4 -0 wins this week. This week, Cavaliers already beat Toronto Raptors and New York Knicks away at home while today the Miami Heat at home. Meanwhile, LeBron James surpassed Elvin Hayes in NBA All-time scoring after scoring 27 points against the Heat. James made a lay up early in the fourth quarter to claim the 9th spot with 27,315 total career points. Moses Malone is the next man in line with 27,409 career points, less than 100 pts away to LeBron James to claim the 8th spot in NBA All-time scoring list. If James continue to average 23 pts or more? He will surpass Moses Malone in the next four or five games? By the end of this 2016 – 2017 NBA Season, there’s a big possibility that LBJ will also surpass the “Big Diesel” Shaquille O’neal who currently hold the 7th spot of NBA All-time scoring list with 28,596 career points, but James must continue to scores at least 23 points per game to surpass? No Comment to " Cavs Beat Heat 114 – 84, LBJ Moves Up in NBA All-time Scoring List "